A Vogel Menosan Sage supports women of menopausal age and contains organically grown sage herb which is rich in essential oils. A Vogel`s very own Eileen Durward has created a simple guide to the peri-menopause, menopause and life beyond the menopause. 15 - 20 drops in a little water 3 times daily. 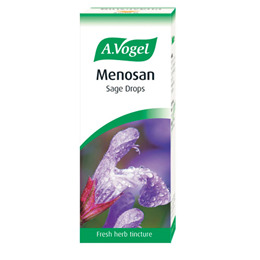 Below are reviews of A Vogel Menosan Sage - Menopausal Age - Tincture -100ml by bodykind customers. If you have tried this product we'd love to hear what you think so please leave a review.